To put on the “new man” mentioned in Ephesians, we need to be led by the Holy Spirit, to hear His voice rather than follow the voices of popular culture. 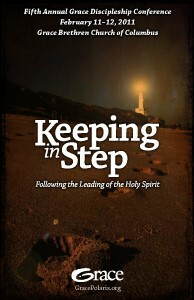 Join Dr. Jerry Bridges and Dr. Glenn McElhinney to learn more about “Keeping in Step” with the Holy Spirit at the fifth annual Grace Discipleship Conference at the Grace Brethren Church, Columbus, Ohio. The event will be held Friday and Saturday, February 11 and 12 at the Grace Worship Center, 8225 Worthington-Galena Road, Westerville, Ohio, 43081. Access to all sessions plus Saturday refreshments and lunch are included for just $40! Register online or call 614-410-3212.